It's time to stop looking away. Your heart breaks that someone has to be on the streets, but the problem feels just too big for one person. The truth is, homelessness is on the rise in West Michigan and this problem is too big for one person or organization to solve. You are needed; your family, your church and your co-workers are needed. Together we can overcome homelessness in Grand Rapids. All you have to do is choose how you want to get involved. "I'm thankful I wasn't passed by." unique homeless individuals came to MTM for help last year. Homelessness can happen to anyone. It happened to James after a devastating divorce. Tecca was served an eviction notice while she was in a nursing home for a broken hip. Meagan put her alcohol dependency before everything else. Charles lost his wife to cancer and couldn’t pay the overwhelming medical bills. For every unique story, there is a unique approach. 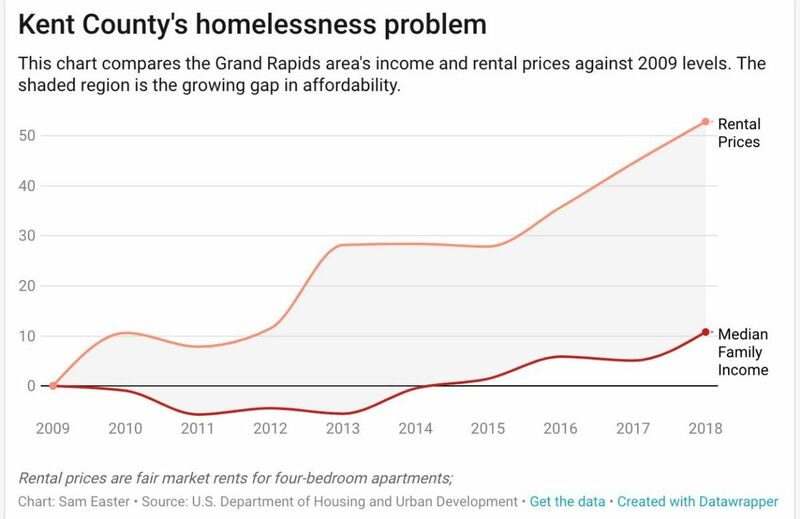 Over the last 5 years, housing costs in Grand Rapids have skyrocketed while wages have remained the same. A lack of affordable housing and social supports are driving many families out of their homes and into their cars, tents or other unsafe places. The face of homelessness might not be who you think it is. The two fastest growing populations of homelessness in West Michigan are families with children and unaccompanied youth ages 18-24.